What epitomizes Summer style more than seersucker? It's crisp, lightweight, and breathable, making it ideal for those days where you want to look pretty and pulled together while also trying to combat scorching temperatures (like the 112-degree heatwave that hit L.A. this past week!). Cue this Striped Seersucker Dress, which I have affectionately termed "the Seersucker Bow Dress." 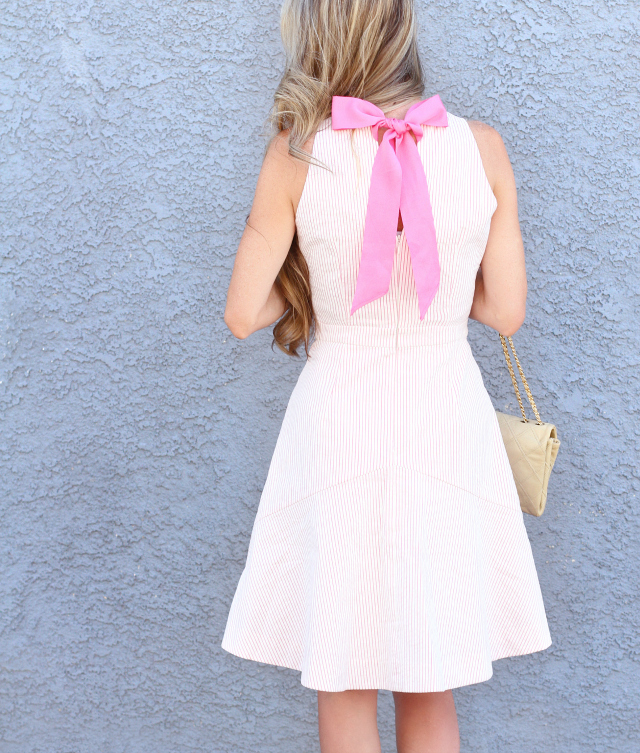 This pink and ivory seersucker dress may look like any other fit-and-flare dress, but it's actually even sweeter with its surprise in the back: a fuchsia grosgrain ribbon bow! It fits my style to a T; it's classic with a modern, feminine twist. The bubble gum-pink ribbon ties at the back of the neck, just above a keyhole cut-out in the dress, adding that extra, special touch that I always seem to gravitate towards. It's so darling! The back-zipper closure comes up to just above the bra-band line, so no special bra is needed, and the ribbons are attached at the top of each side. The tied bow finishes the dress beautifully. The icing on the cake for me was the sale price. It was marked down to $50 with free shipping during a flash sale that ran last month (retail value listed as $118, so over 50% off!) and of course I snapped it up. It's still a steal at the current sale price of $59.99 + $5 flat-rate shipping, and most sizes are still available! I ordered the smallest size available, size 00, based on the size chart and was thrilled to find that the dress fit nicely straight out of the package. The waist runs about a 1/2" wide on me, but it leaves enough room for any large meals, so I'm totally fine with it. ;-) The length is perfect, hitting me right above the knees (I'm 5'2" for reference) and the flared skirt makes for some fun twirling, too! The dress is cotton with a hint of spandex, so it's slightly stretchy and contours your shape nicely. It's also fully-lined and machine-washable. Cute, comfy, and low-maintenance? Yes, please! This dress is easily one of my favorites this season, and I can see it being worn to multiple functions: bridal or baby showers, brunch dates, or even just fun lunch/dinner outings with friends and family. It's the very definition of easy-breezy; just throw it on and go. I also adore this nectarine seersucker tie-cuff blazer and pencil skirt -- such a charming set that can be mixed and matched for the office and the weekend, and the color is so unique! Which are some of your favorite seersucker pieces? Ann Taylor Esme Ankle-Tie Sandals - sold out (similar here, here, cute flats option here) // Revlon Ultra HD Matte Lipcolor in "Spark"